Stranges in front of one of the bookshelves in his office at Hayes High School. Recently rehired Hayes High School Principal Richard Stranges says he has plans to end his career at Hayes but not just yet. 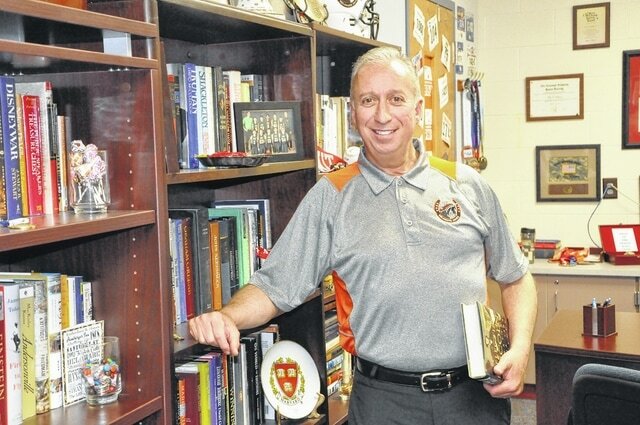 Stranges, an avid runner with medals from half marathons adorning his office, equated his recent rehiring by the school board to a marathon and said that, rather than cross the finish line now when he is hitting his stride, he would rather move the finish line and finish strong. Stranges came to Hayes High two years ago after a a visit to the Delaware for a hall of fame ceremony and saw the community embrace and celebrate the alumni from the school. Stranges said he is an avid reader and reads multiple books a week in order to keep learning and growing. He equated being a teacher to reading because you are always growing. Stranges said the key to being the principal at Hayes is being visible and being approachable. Stranges said many principals want to go on to be superintendents or take other administrative jobs, but Stranges said he is happy right where he is and doesn’t plan on taking another position. Stranges’ retirement was announced at a March 2 board meeting by Craft. Craft said Stranges is retiring because of changes in the State Teachers Retirement System which require educators considering retirement to work 35 years, instead of 30 years. Craft also announced his intention to rehire Stranges because of the work he has done at Hayes in the two years he has been there. Craft said it would be one of the district’s only retire/rehires, and the first while he has been here. On June 1 the board approved Stranges’ rehire.